The following list describes 4 Gmail features that have helped my productivity and sanity. 1) If you have other email accounts and you want to administer them all from Gmail you can. It's easy to do. First you need to log in to your other account and forward all emails to your Gmail account. For Yahoo mail, go to the cog icon, then Settings, then click the Edit link in the top right hand corner of the pop up box. Then go to Access your Yahoo! Mail elsewhere and select Forward and type in your gmail address. Other email clients will have a similar setting somewhere, dig around. If you have another account say associated with your websites domain name get your webmaster to have your emails forwarded to your gmail account. Good, now you receive all your emails from other accounts, but how do you send as that email account. 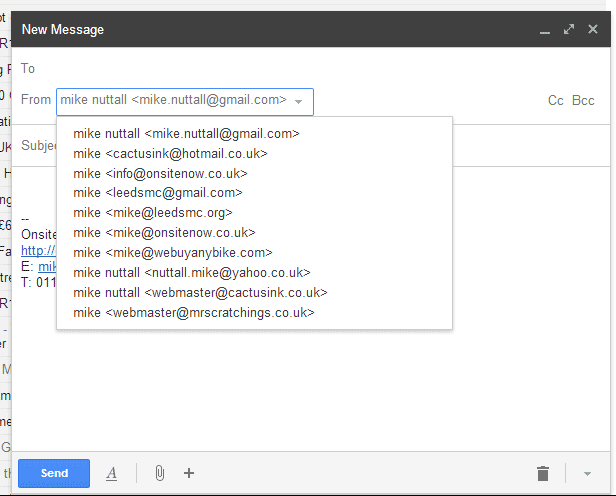 Go to the cog icon, choose Settings then Accounts then find Send mail as: and click Add another email address you own. You then add the email address of your other account, follow the steps to send it a verification code. Now because you have all emails to that address forwarded to your gmail account the verification code will arrive in your gmail inbox. Copy the verification code into the box provided or click the link in the email. You should now be able to send emails with that accounts identity. When you compose an email you will get a drop-down list of all your email properties in the From field, as shown below. Simply select as appropriate. The following 2 features are all part of Google Labs and aren't enabled by default, I have found them very useful. 2) The Undo Send Function. When writing an email have you ever hit the send button and regretted it? I know I have. Well there is a solution, the undo link. When this is enabled you have 10 seconds to change your mind after pressing send. You click the undo link and the email is retrieved unsent, and you can make the appropriate changes and give a huge sigh of relief! When writing emails to clients or replying to customer enquiries there are occasions when you might find yourself typing the same thing over and over again. With canned responses you can save commonly typed text so that you can insert it into an email with just a couple of clicks. You can use canned responses when you are writing a new email or replying to one. At the bottom right hand corner in the tool bar next to the trash can is a down arrow, click that and you should see the Canned responses option. If you then select that you will get Insert, Save and Delete options with which you can insert, create and delete your canned responsed to your hearts content. I thought this was a Labs feature too, but it appears to be standard. When you get an email with a date in the body text, Gmail automatically makes it a link. If you then click that link you can get the option to add an entry to your Google calendar with the subject title of the email as the entry. Genius.